Angus beef is traditionally prized for its smooth, close-grained texture, carnation red colour and finely marbled muscle and today the breed is widely recognised as signifying high quality red meat. But as Kate Brabin of the Certified Angus Group points out, a lack of regulation around meat labelling means it’s possible for meat which isn’t actually from Angus stock to be passed off as such. To combat this, the Certified Angus Group, owned by the breed society members of Angus Australia, provides breed verification and third party certification to Angus brands, including the Angus Australia Member owned Certified Australian Angus Beef (CAAB) brand. Under the CAAB trademark, Certified Australian Angus Beef is sold to 31 countries around the world. But CAAB is far more than just a brand – as its name suggests, it’s a proven signifier of product quality backed up by an authentic paddock to plate certification process. “The CAAB brand attests to the quality of the product, including breed authenticity, that it meets all Meat Standards Australia (MSA) requirements, that it has an average marble score of 2, and that it has been additionally aged to guarantee flavour,” Kate explains. CAAB beef has been subject to strict certification from the supply of livestock through each step of the production process – feedlot, meat processor, distributor and finally to your foodservice business. “All the way through the supply chain, the certification process is in place to protect product integrity,” Kate emphasises. In fact CAAB is the most awarded meat brand in Australia – it has won 27 medals in its 21 year history, from grand champion to champion and picked up gold, silver and bronze in the Fine Food competitions in both Sydney and Melbourne. Both CAAB and Angus Pure beef boast the same marble score of 2, and it is this factor which makes Angus the preferred choice of so many foodservice professionals and consumers. Angus beef’s ability to consistently marble has been described as its greatest attribute, as highly marbled beef delivers superior flavour and tenderness. Of course there is a flavour difference between grain-fed and pasture-fed Angus, and which one a restaurant offers depends on customers’ taste preferences. 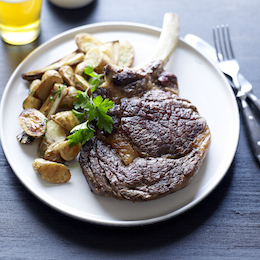 “When you choose Certified Australian Angus Beef, you know that the cattle have been grain fed on high quality cereal for a minimum of 120 days, that the meat has been independently verified for breed, that it’s been graded for quality by Meat Standards Australia, and that all cuts have been aged for 21 days, with striploin aged for 28 days to ensure full flavour and tenderness,” Kate adds. And thanks to the superior quality, it’s easy to cook – so you can be assured of serving the customer a cut they’ll enjoy. Certified Australian Angus Beef and Angus Pure are available from distributors all across the country – to find your local supplier contact angusbeef@caab.com.au.